Change the way you stuff a turkey by using oranges, lemon and limes for a moist, delicately flavored bird. You will save calories and fat grams by not using traditional stuffing, which is loaded with butter that soaks into the meat. The fresh citrus creates a porous area inside the cavity and provides moisture that steams and seasons the meat. Adding herbs that complement the citrus and turkey is a simple way to stuff the bird, and creates a fresh, flavorful meat. Rinse the inside and outside of the turkey with cold water. Pat the surfaces dry with a paper towel. Wash the outside of an orange, lemon and lime with water. Cut the citrus into quarter-sized wedges with a sharp knife and cutting board. Rinse three or four sprigs of fresh herbs with water. 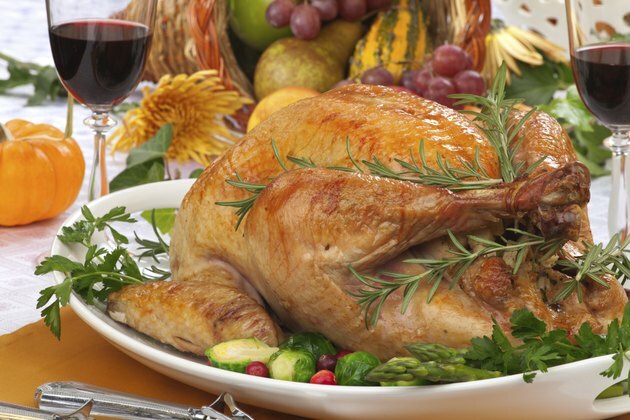 Herbs that complement turkey are rosemary, thyme or marjoram. Stuff the orange, lemon and lime wedges into the turkey cavity with your hands, and then stuff in the herbs. Any unused citrus wedges can be used as a garnish on the turkey platter later. Tie the legs together with cooking string to keep moisture and heat inside the turkey for steaming the citrus. Cook the turkey in a 400-degree Fahrenheit oven until the internal temperature in the thigh and breast is 165 F or higher. Leave the citrus in the turkey as it cools for additional moisture. Discard the citrus when done carving. Cut an onion and a garlic clove into wedges and insert them into the turkey cavity with the citrus wedges for additional flavor. Wash your hands before and after handling a raw turkey.